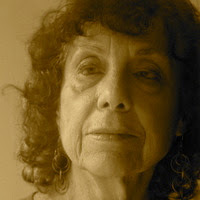 A Year of Being Here: Lynne Sharon Schwartz: "Repotting"
the way a healthy child outgrows its clothes. place pebbles and shards from a broken pot for drainage. so the soil gets under your fingernails. care so as not to disturb its wiry roots. tapping it down till you almost reach the rim. Flounce the leaves as you would a skirt. Then water. Place the pot back on the shelf in the sunlight. and discard. Watch your plant flourish. You have done a good and necessary deed. 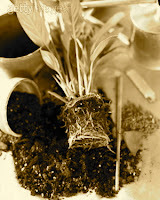 "Repotting" by Lynne Sharon Schwartz, from See You in the Dark. © Curbstone Books, 2012. Photograph: From www.gettyimages.com (originally color).